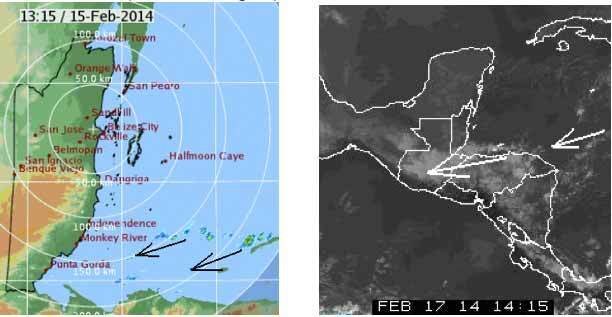 Belize NMS: Mainly fair and dry conditions will prevail the next couple of days. Today: Winds: NE'ly 5-15 kts. ; seas: Light chop - choppy. ; waves: 2-5 ft.; little or no rainfall. Tomorrow: Winds: E-NE 5-15 kts. ; seas: Choppy. ; waves: 3-5 ft.; isolated showers south. Marine Outlook: Tuesday night:- winds: E-NE 5-15 kts. ; seas: Choppy. ; waves: 3-5 ft.; isolated showers. General Outlook: For Tuesday and Tuesday night is for continuing mainly fair weather with only isolated showers. On Ambergris Caye this morning we have a clear sky, calm sea and expected high of 84f. Wind from the East at 7 mph. Clear skies, not a cloud in sight inland, yet rain over the Sea off PG. . . . . Looks like that sort of front is lingering down South Belize, causing the occasional Rain showers, only these have been building up not dying down. . . .. But I expect as the temperatures rise, they will die down. . .. Some puffy cloud developing later today. Looks like this sort of weather could be with us for several days.